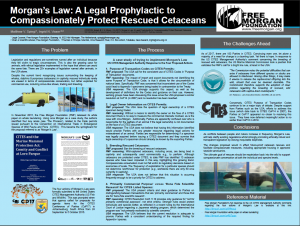 Free Morgan Foundation (FMF) board members Matthew Spiegl (Legal Counsel) and Dr. Ingrid Visser (Chair & Scientific Advisor) have co-authored an Abstract and Poster for presentation at the Third International Compassionate Conservation Conference, Sydney Australia (20-24 November 2017). The poster highlights the work of the FMF to effect policy change through active engagement with the Parties to CITES (the Convention on International Trade in Endangered Species of Wild Fauna and Flora), the European Union and individual Nations such as the United States of America. By taking actions such as these, the FMF strives to take the lessons learned in orca Morgan’s case and apply them to protect a broader cross section of rescued cetaceans. We do so because high valued cetaceans increasingly find themselves in peril of commercial exploitation after being rescued, such as the 13 species which have currently been identified as being used commercially, after a rescue.